1-CD with 16-page booklet, 12 tracks. Total playing time approx. 44:33 minutes. The beauty and the voice! Sandy Wild is THE new , female Rockabilly vocal sensation. Backed by her gang of rough and tough men. Founded in 2014, the band recorded its debut, 'The Girl Can't Help It' (BAF19001, 180g vinyl LP) in 2015, containing great covers of classic tunes. The video clip to Wild One (Real Wild Child) led to an explosion on the YouTube channel causing worldwide attention. Bear Family is proud to present the new Sandy &, The Wild Wombats album, , coming soon on Bear Family Records! The band’s second album is somewhat different and comes with 12 original songs written by their guitarist, Mark Twang. Sandy &, The Wild Wombats are in fact a live band with a frenzied live show - and this, along with a thrill of ecstasy, is exactly what the band captured on record. The sound of the Wild is truly based on 1950s Rockabilly. The new album is full of Rockabilly rhythms mixed with more or less modern Rock'n'Roll rattles, some Blues orientated songs, some Country-influenced tracks, plus a ballad. And on top of it all is the wonderful voice of Sandy. Her singing has a strong resemblence with the vocal style of the late great Wanda Jackson. However, she’s singing in a way completely her own. Sandy has left her personal mark on every song. 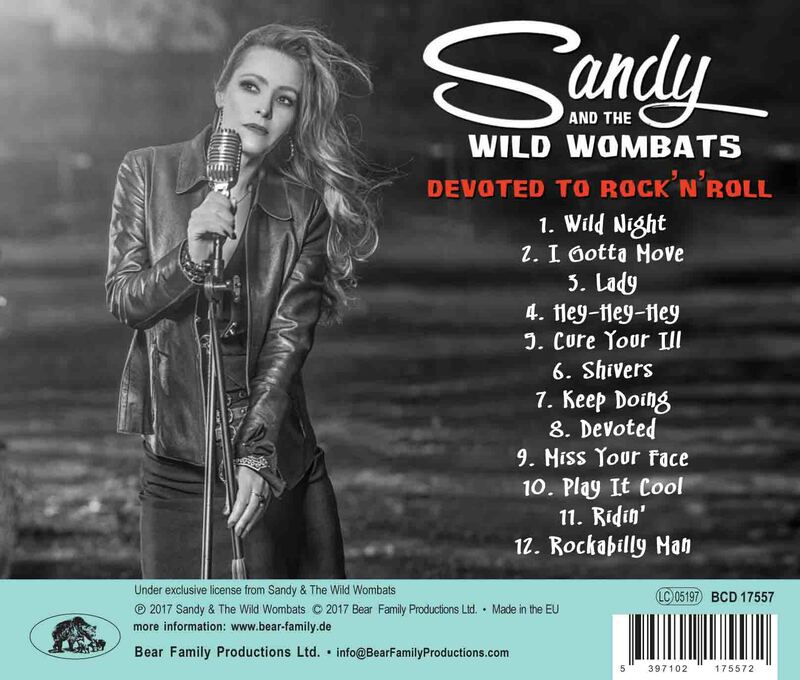 "Sandy & The Wild Wombats"
Anyone listening to Sandy & The Wild Wombats for the first time will wonder how they have chosen their songs for this album. Fifties' classics – some of them almost forgotten - are revived here in new glory. Sandy's rough voice alone clears the old songs from its dust and make them up-to date again. And what power they get in the Wild Wombats' new rendition! It's the rough edges – the hard tones – that make Sandy & The Wild Wombats so appealing. Recorded and produced privately at the beginning of 2015, it was just to be a simple but usable demo recording. But the power and the enthusiasm – and of course Sandy's hot and expressive voice combined with tough backings of her band's musical talents – all of a sudden they had a complete album in their pocket! With no flat spots, humorous, not too serious, Sandy & The Wild Wombats are on their way to stardom – with this album and with their wild and frantic live shows! For the first time, a modern rock'n'roll and rockabilly band has the courage to cover the classic Elvis movie song “Got A Lot O’ Livin' To Do”, bringing it back to life again. Listen to Sandy singing “Riot In Cell Block #9”rendered in the best Wanda Jackson style and “Have Love, Will Travel” takes also part in a series of great interpretations, although here the number is rather inspired by the Sonics' 1960s version than the striking Doo-Wop original by Richard Berry & The Pharaohs. Most of the songs on this album were prompted by special requests (“Hello! I'm special! Play me!”) and followed the motto: “Why not try that one?” The idea was simply, “Make it rough and dirty! Just sing it! Just play it” One can feel it! So turn off your brain computer and get the feeling! Customer evaluation for "Devoted To Rock 'n' Roll (CD)"
InMusic 9-10/17	"Sandy Wild und ihre Begleitcombo bringen frischen Wind in die Rockabilly Szene. Auf ihrem zweiten Album vermengen sie gekonnt 50er Jahre Rockabilly mit zeitgemäßem Rock, Blues and Country. Hörenswert!" OX 8-9/17	"Na bitte, Deutschlands Rockabilly-Szene hat endlich die noch fehlende Rockröhre im Angebot. Absoluter Tipp!" Good Times 4/17	"Man darf eine Scheibe erwarten, bei der bis auf einen ruhigen Titel mächtig die Post abgeht." 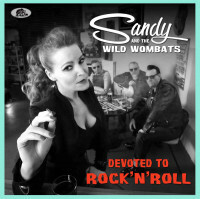 Press - Sandy & The Wild Wombats Devoted To Rock 'n' Roll - UK Rock and Roll Magaziner Family Records of Germany have long since held the crown for the kings of quality re-issues. Their back catalogue of boxsets lavished on artists hardly household names has borne testament that they are a rare entity a label in it for the music and not just the money.